One of the most exciting and nerve-racking scenarios in football is third and long. You know your team has to put the ball in the air, and the opponent knows it too. Just how difficult is it to convert in these situations? To start, let’s put such a situation into perspective by looking at how difficult it is to convert any type of third-down scenario — this includes third-and-short yardage situations as well. In the 2018-2019 season, the reigning national champion Clemson Tigers faced third down on 202 occasions and only converted 93 times. That is a success rate of 46 percent, from the best team in college football. If the Tigers, who ranked third in total offense last season, couldn’t even convert half of their third-down attempts, I think it’s fair to conclude that drawing up plays for these scenarios is a tall task. So what makes these plays so difficult? Often these situations require every unit to do its job at a high level. The offensive line has to give the QB enough protection. The QB has to read the defense accordingly. The throw has to be accurate. The wide receivers have to run good routes and (yes Duck fans) catch the ball. And most importantly, the schematics have to put these players in a position to succeed. When a defense lines up, it can often be confusing to identify the type of coverage. Even worse, defenses have more options than usual on third and long, making it harder. They can sit back in zone and force a tight window, or they can jump into man coverage and (probably) bring pressure, forcing a quick throw. 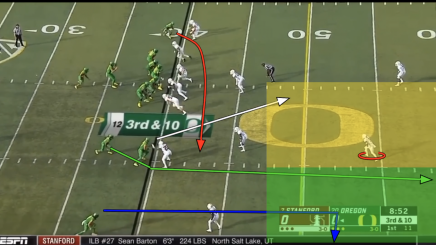 In this analysis we will examine Oregon’s Over/Under passing concept, and analyze how the Ducks use it in long-yardage situations, regardless of coverage. These concepts are designed to either force a defender to cover a receiver in a large amount of space or force a defender pick one of two receivers in a particular area. Above is a very common alignment for a third-and-long scenario, where the defense can be in zone and/or man defense. Stanford has a defender in the face of the tight end with Dillon Mitchell stacked behind him. This alignment allows for Mitchell to get to his route quickly without a defender making contact to slow him down. The play design is critical in these situations, as the spacing and timing must be on point. Here, it turns out Stanford is playing man coverage with two safeties to help on deep routes. Above you will see how an offense can even the odds on third and long. Oregon chooses to only run routes that attack two thirds of the field. This strategy allows the QB to focus all his attention on the two zones highlighted above. This concept is similar to the “fight-in-a-phone-booth” analogy used by run-oriented teams, only here, it is utilized in the aerial game. The above route concept allows the QB to have both “over” and “under” options to choose from, based on how the defense reacts in coverage. The read key (red circle above) is the most important defender because he is the only defender who can cover either the yellow or green passing zones beyond the first-down marker. However, he is still human, and thus cannot cover both zones at the same time. All the QB has to do is wait to see what the read key does. Above, the QB checks the identified read key (red circle) during his drop back. The read key has chosen to play the “Under” route of his zone as he begins to move forward. This means the QB will throw to the “Over” route, where the read key vacated. This leaves a defender one-on-one with the Ducks’ best receiver Mitchell in a sprint down the field. If the read key would have dropped back to cover Mitchell, the throw should go to the tight end (white arrow two images above) or the drag route (red arrow two images above). Above you will see the complete play as the QB goes through his progressions. I included a view from the defensive side of the ball to illustrate how the route develops from the perspective of a defensive back. The final view also shows the difficulty that this concept presents a defense. Defenders are forced to make quick decisions while covering a large amount of space. Moving to a new scenario, above we see the defense aligning with a safety (out of the screen) over Mitchell to prevent the deep pass. 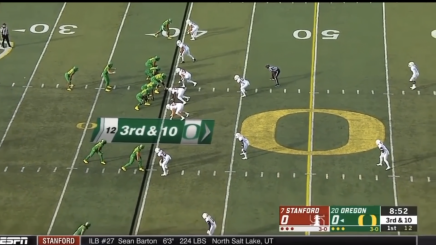 This alignment may have been an adjustment by Washington after watching Oregon score on the previously diagrammed play two weeks earlier against Stanford. This would be a situation where the QB should throw the “Under” route because the defense has overcompensated to cover a possible “Over” route. 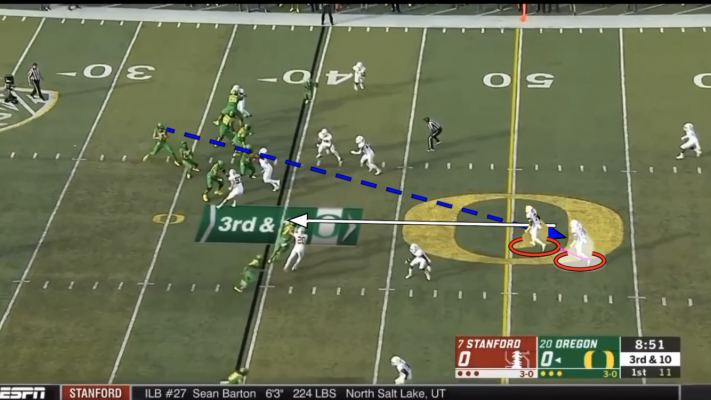 In this play, Mitchell runs a stop route (green arrow) instead of the deep route he ran in the Stanford game to take advantage of what is now the “Under” portion of the defense. Once the read key (red circle above) commits to the middle of the field (red zone above), the QB will throw to the under route (green arrow above), again putting Mitchell in a one-on-one situation with a lot of grass. The Over/Under concepts can be applied to various situations and do not require a deep route to create openings in the defense. Above is a third-and-6 scenario in the red zone, which limits the offense’s ability to stretch the field vertically due to the shortened field. Such scenarios often require the offense to be creative and use different techniques to create space for receivers. In the play above, four receivers are running deep routes (white arrows) to the back of the end zone to remove as many players as possible from the line of scrimmage. The drag route (green arrow above) then brushes underneath the corner route to the right, near the line of scrimmage. This technique is referred to as a “pick play,” as the corner route disrupts the pursuit of the defender just enough to create space for a run and catch on the drag route. As there is not a lot of field space to work with, the offense can create space by slowing down or impeding pursuit angles with a “pick play.” When you hear someone refer to the spread offense as “basketball on turf,” this may be an example of what they are referring to. The above play is similar to setting a screen for another player on the hardwood. Finally, the play above is similar to the previous red zone situation where the Over/Under concept is effective. Here, the QB again knows he will throw the under route (out route). It is unlikely that the slant route is an option due to the defense having two defenders aligned over the route. Therefore, the slant is used as another type of “pick play” to slow down the defender trying to cover the out. This is just another example of how offenses can create separation from defenders with a limited amount of space using Over/Under concepts. 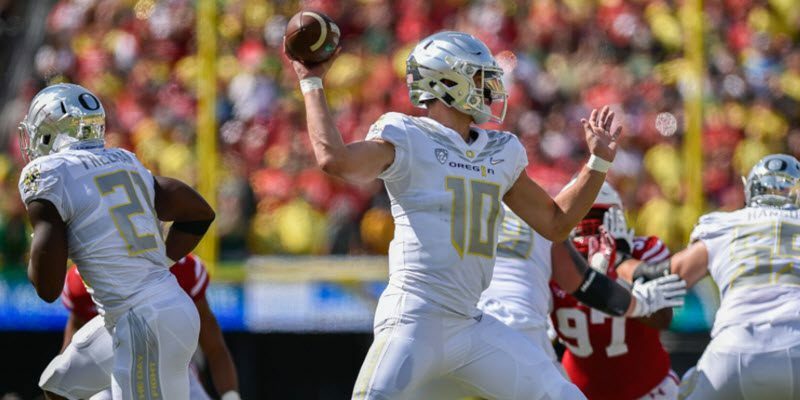 The 2019-20 season will be interesting with respect to the Duck passing game. Oregon returns a lot of role players who made the “Over/Under” concepts successful last season. Perhaps next season a new primary target will emerge from the current receiving core, an incoming transfer or freshman. We shall see.